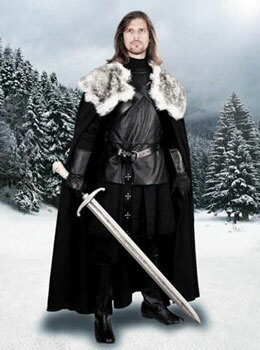 Games of Thrones costumes for sale include the Jon Snow Night’s Watch Cape. This officially licensed costume features a faux fur lining on the neck. The cape has dual leather straps. It also features an adjustable buckle that ensures the cape stays in place during battle. The Jon Snow Night’s Watch Cape is a must have costume for any true Game of Thrones Fan. One size fits most.